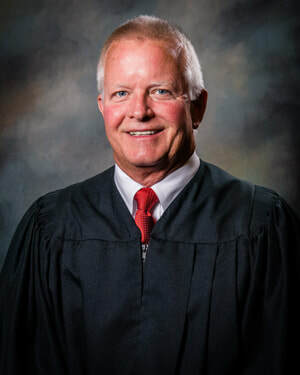 J​eff Parham was elected Weakley County Circuit Court Judge on August 7, 2014. He resides over the 27th Judicial District, which serves both Weakley and Obion Counties. ​Parham grew up and worked on his family’s farm in the McConnell Community. He is a South Fulton High School and University of Tennessee at Martin graduate. Parham attended the Nashville School of Law beginning in 1989 where he attended classes four nights a week, while he maintained a full-time day job. After graduation, he came back home to provide legal services to his community. ​Parham has been a licensed attorney for over 20 years; having offices in both Martin and Union City. His practice consists of both criminal and civil matters, including estates, divorces, and custody. In addition, he is a seasoned real estate attorney. Parham has represented countless individuals, small businesses, and large corporations. Parham currently lives in the McConnell community, located between South Fulton and Martin, with his wife, Tina. They have three children, a son Alex, who currently attends Logan College of Chiropractic in Chesterfield, Missouri, a son Blake, a University of Tennessee at Martin sophomore, and a son, Ethan, a seventh grader at Martin Middle School. Parham is a current member of the Martin Rotary Club, where he serves on the board of the Directors. He also serves on the boards of the Fellowship of Christian Athletes and We Care Ministries. Parham previously set on the Martin Youth League Football and Cal Ripken Baseball Boards. Parham served as a hearing officer for the Tennessee Board of Professional Responsibility from 2006 to 2012. The organization oversees the ethical responsibilities of our state’s lawyers. Parham was chosen Weakley County’s Best of the Best Award for Best Lawyer in Weakley County for the years 2009, 2011, and 2012. The Parham family are members of the First United Methodist Church in Martin, where Jeff has chaired both the Trustee’s and Staff-Parrish committees, along with teaching the high school age Sunday school class.